Open from 9.00 to 23.00 (or 9.00 to midnight from mid-June to early-september). The Seine River Cruise operates from from 9:30am to 7:15pm. For an introductory tour of the city, take a cruise during the day. We are comparing Eiffel Tower Skip-The-Line Ticket & Seine River Cruise Prices from leading ticket suppliers and Try to find you Cheap tickets prices on the market. This convenient package combines a visit to the most popular monument in the world and a relaxing cruise along the Seine River. During the self-guided tour of the Eiffel Tower, you can learn a lot about this infamous monument from the inside exhibition. Among other related facts, you will find out what saved this much-loved structure from its planned demolition. Also, admire outstanding views of the cityscape from the 2nd level. While cruising the Seine River, you will have a pleasure to admire other striking landmarks of Paris and its numerous bridges. This package offers a convenient tour of the Eiffel Tower, followed by the Seine cruise, another much-anticipated activity in Paris. The combined tour is suitable for everyone, families, couples, and adventurers. Your Experience With Eiffel Tower Skip-The-Line Ticket & Seine River Cruise? The "Two in One: Eiffel Tower and Seine Cruise Tickets" package entitles you to enjoy two of the most popular experiences in the City of Lights. The Eiffel Tower is the most visited monument in the world so queues can be incredibly long. With this convenient ticket, you skip lines and directly enter the Eiffel Tower, where you can enjoy an interesting exhibition and great views of the city. You will head to the 2nd level, from where you can have an overview of Paris and see the outline of other famous attractions. Theonsite museum can teach you everything you need to know about this celebrated architectural masterpiece and tell some interesting tales and fun facts. If you wish, you can proceed to the 3rd (top) level on your own(not included). After the tour, you can take the Seine River cruise and discover other top attractions of Paris. As you cruise, you will lay eyes on the majestic Louvre, astonishing Pont Alexandre III, striking Notre Dame Cathedral and various other well-known landmarks and points of interest. What Eiffel Tower Skip-The-Line Ticket & Seine River Cruise Includes? The ticket includes skip the line entrance to the Eiffel Tower and a 1-hour Seine River cruise. The ticket to the Eiffel Tower includes access to the lower 2 levels of the monument. Access to the Eiffel Tower exhibition. Unlimited time inside the "Iron Lady". Flexible ticket for the Seine River Cruise. Use the Eiffel Tower’s telescopes take a closer look at the city centre. The cruise on the River Seine is the most romantic at twilight or during the night. Travelers Reviews about Eiffel Tower Skip-The-Line Ticket & Seine River Cruise? The Seine River cruise and a visit to the Eiffel Tower are some of the most popular activities in Paris. They have rated their experiences with an average of 4.6 out of 5-stars onYour Guide and of 4 out of 5-stars on Viator. 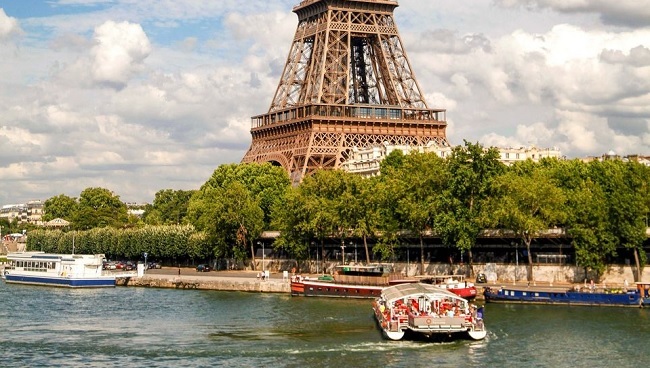 Furthermore, they say that the Tour Eiffel offers extraordinary panoramic views while the Seine cruise reveals many great sites as you pass beside them. The Eiffel Tower tour is not wheelchair accessible. If you arrive late for your entrance time then you may not be allowed inside and a refund will not be issued. All sales are final and incur a 100% penalty for the cancellation. Your ticket for the Seine River Cruise is valid for 6 months from the first use (It does not need to be used on the same day that you visit the Eiffel Tower). Arrive at the specified meeting point for the Eiffel Tower tour 15 minutes in advance. For the cruise, pick up your tickets at the ticket office. Meeting point: 41 Avenue de La Bourbonnais address.